Kid-friendly activities are great, but sometimes an outing that is not design just for children is as much fun, less crowded and a lot cheaper. Today we went to a local arboretum. It was free, it was a cool and shaded place to be, and very calm. We walked up and down the hills while our son ran in front of us. 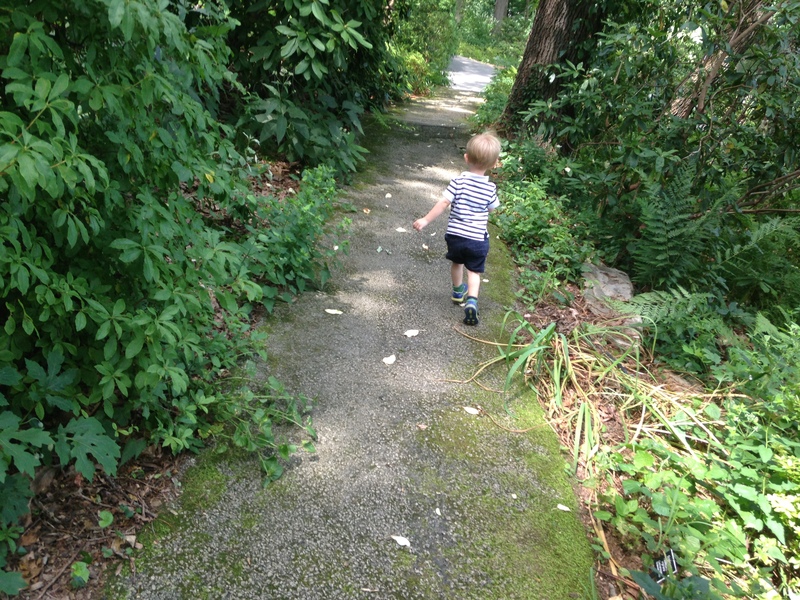 He learned to stay on the trail, a couple of new words and to respect the plants. He had fun pointing out colors, choosing which path to take and running up and downhill. He is now taking a long nap. That is a win in my book. The very peaceful arboretum was the perfect place to run and discover chipmunks. Here are other free or inexpensive activities that can be fun for young children, even though they are not designed specifically for them. Just keep an open mind and a lot of patience. The younger they are, the shorter the time spent on the activity. If you want to add to the learning experience, read books before or after about something related to the activity. For example, before our trip to the beach a couple of weeks ago, we read a book about the beach that I had specifically checked out. This added to the excitement and he learned a bunch of new words before we even got there. 1- A bus or train ride: Transportation is always a big hit with my son. When we have gone on buses, trains or planes we talk about them, imitate their sounds or sing songs about them – think “The Wheels on the Bus.” Destination is not important, focus on the ride. 2- A visit to the farmer’s market. If you don’t have the pressure of getting your shopping done, you can have more fun looking at fruits and vegetables, touching, smelling and tasting new foods, and talking about what you can make with them. Top it off by making a meal afterwards with your purchases. 3- If your local library has a lunch area, it is fun to spend an afternoon reading and snacking. Pack a snack or a lunch, check out some books and spend some quality time together. 4- Hiking or visiting an arboretum. I’ve had people tell me before that this is not a great plan for kids, but we’ve always had a great time. The key is to give them some freedom and limit your stay so that they are not tired or hungry. 5- Help a pet shelter. Call ahead and ask if they need supplies, if they do, put together a care package and bring to the shelter. Some shelters need volunteers to walk the dogs, ask before going if this is something you can do with your kids. What are some inexpensive and not specifically designed for kids activities you do with your children?